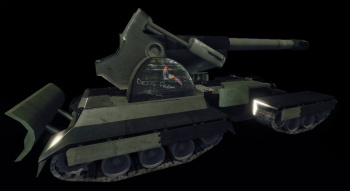 The Long Tom Artillery Tank (abbreviated LT or LTA) is an Inner Sphere mobile artillery platform that brings to bear the deadliest weapon in the game: its namesake, Long Tom Artillery. Despite having very low acceleration, weak armor, and a somewhat high price, it is capable of inflicting devastating damage from far behind friendly lines. LT users should generally stay behind the front line, covered by an AA unit when required, firing upon high-value targets such as Assault Mechs, any groups of enemy units or LRM campers. Because of the significant projectile flight time it is often necessary to lead the target by a few seconds, although direct hits are not required to do crippling damage due to the significant splash of its shells. To aim the weapon, one may use the distance to the target indication displayed below the enemy damage readout, and the turret rotation indicator visible above the radar. Long Toms need to be deployed in order to fire. To do so, the pilot must stop the vehicle on flat ground and when HUD indicator on the minimap shows up press the crouch/deploy key - [Left Ctrl] by default. A Long Tom won't deploy on bumpy terrain or a slope, or while the tank is still moving. In order to move again, the pilot will need to undeploy it using the same key. Perhaps the greatest threat to Long Toms are Aerospace Fighters. Because of their very slow acceleration, low armor, immobility while firing, and inability to defend themselves from air threats, the Long Toms must rely upon other units for air defense, or hope to remain undetected by using passive radar. When dealing with hostile LT when Aerospace is not an option, other tactics needs to be applied. Approach on passive radar while concealed; a close-range unit can quickly destroy a Long Tom, especially when focusing on its very weak back armor. Alternatively, the LT can be carefully engaged with long-range options. For example, closing to within 1000m with a Trebuchet Vulture and loosing a full barrage of missiles can destroy or heavily damage the LT. Yet in most cases small, hard-hitting units with high speed can take down the Long Tom alone, most notable killer being the Shadowcat which mixes very high speed (utilizing its MASC) with significant firepower. Enhanced Optics, or EOptics are an upgraded version of the standard optics found on all units in the game enabling a zoom of 2.5x. EOptics are useful for precision and long-distance aiming, as well as picking out targets from their surroundings that were otherwise undetectable by radar. The Beagle Active Probe or BAP boosts radar detection range by 200m. Providing a maximum range of 1200m. The Bloodhound Active Probe or BHP boosts radar detection range by 400m. Providing a maximum range of 1400m. The Guardian Electronic CounterMeasure Suite, or GECM, is an advanced electronic warfare suite that can be used to reduce the range at which enemy units can detect you on Radar, a unit's radar signature is reduced down to 500 meters. Terrain can become an important factor when piloting a Long Tom. A map that consists of rolling hills like TSA_Marshes is one where the terrain will not pose as much of a problem, whereas a map like TC_Mirage will be much more challenging. There are benefits to terrain differences. For example, The range of the Long Tom Artillery is listed as 1500m, though it can commonly reach longer. If a Long Tom is positioned at a higher elevation than where its rounds would land, this effectively, increases the round's maximum range. If the terrain of a map includes steep cliffs, this will complicate effective artillery. This has a number of detriments, including cliffs getting in the way of the flight-path of the round being fired, and needing to use the 45+° angles on the LT. The map TC_ThunderRift is a great example of how the role of a Long Tom is severely limited by terrain. For more open maps, consider asking teammates to watch for where your rounds land, to determine if they are getting caught up on a bit of terrain. Lastly, for 45+° angle shots, the flight time is roughly doubled of an equivalent shot at a sub 45° angle. 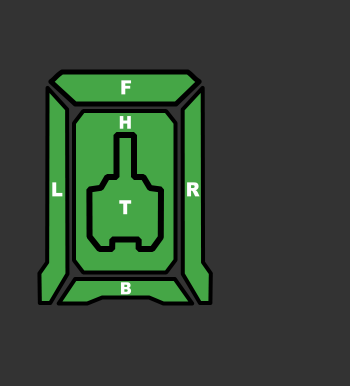 This limits your minimum range, and complicates the alignment of a target as a small change in rotation of the turret can sometimes lead to a more pronouced effect on where the round will actually land. For this reason, and the reason above, rugged terrain can put a serious damper on Long Tom support, but will not completely rule it out. An artillery unit cannot effectively engage an enemy that it does not know about. Running primarily under passive radar or with ECM may save your life. Conversely, a C3-equipped unit can significantly boost the effectiveness of any in-range, appropriately-positioned allied artillery (as could, hypothetically, a spotter, possibly with a TAG, operating in tandem with an expert artillery operator). It is more challenging to hit a rapidly-moving target than a stationary target, especially if the target is moving inconsistently; the greater the range and speed, the greater the challenge. Artillery will have a difficult time effectively striking the leeward side of a hill (relative to the trajectory of the artillery), as the slope of the hill will be closer to parallel with the trajectory of a falling artillery round, making the round more likely to strike the top or base of the hill. In that same vein, take great caution when approaching a deployed Long Tom over a hill. If it sees you coming, one last desperate point-blank shot will end your attack. When lacking a radar signature to target, range to target can also be found by moving the targeting reticule over the target or something nearby. The Long Tom was first introduced in version 0.2.0, and was originally a modification of the Partisan tank chassis. In version 0.3.0 the Long Tom received the Deploy feature along with a remodel of the entire unit, new texture work, and new animations. Related sounds and HUD effects were also added. Mobile Long Tom Artillery was made of six tracked transport working to support, move, and store ammunition for the great cannon. The main cannon transport weighed 55 tons, while the unit as a whole weighed 95 tons. Maximum speed was barely 32 km/h and was often limited to paved roads as on rough terrain it could easily get stuck. Typically Mobile Long Toms operate in groups of up to six guns and their attendant support craft, heavily guarded by tanks and anti-air units. As the cannon carries only four tons of standard armor it cannot withstand any stronger attack, so extensive security is required. Long Toms are also stationed near the key cities of more important planets, with one or two assigned to garrisons. The Long Tom is an uncommon weapon with origins reaching the Star League. Many attackers choose to withdraw rather than facing he devastating firepower of multiple cannons working in tandem. One such example took place during a House Marik assault on Loric in 3002. Thinking that they faced 3 Long Tom batteries, the FWL troops withdrew without inflicting damage on the Lyran defenders. Usually even the most damaged Long Toms are repaired instead of being stripped for parts, as happens with many other non-'Mech units.